Taking a break from the thrilling conclusion to Daredevil #607, Daredevil’s 2018 annual takes a look back into the past. Writer Erica Schultz, joined by artists Marcio Takara and Marcelo Maiolo, takes the opportunity to reach back and show an early case from Daredevil’s career and his first run-in with fan-favorite bionic supercop Misty Knight. Taking place “years ago,” the tale focuses on one of Misty Knight’s earlier cases, long before she had her iconic bionic arm. A detective with the NYPD, she finds herself working on a series of cases involving missing persons. During the investigation, Misty also keeps running into Daredevil once it turns out one of the local gangs is involved. However, Misty isn’t exactly a fan of masked heroes at this time, and Daredevil himself is mightily arrogant in his early days as well. Can the two of them find out why these people have vanished, figure out why Mutant Growth Hormone is involved, and tolerate one another before a fight breaks out? Erica Schultz does a great job showing that these characters are still young, early in their respective careers, without over-explanation or relying on a framing story flashback. The fact that this story simply expects the reader to keep up with a quick caption of “years ago” is wonderful, freeing up many pages to expand on the story. It really avoids a lot of flashback story problems, such as depending on unreliable narrators to create friction or over-explaining how someone got out of their problem. 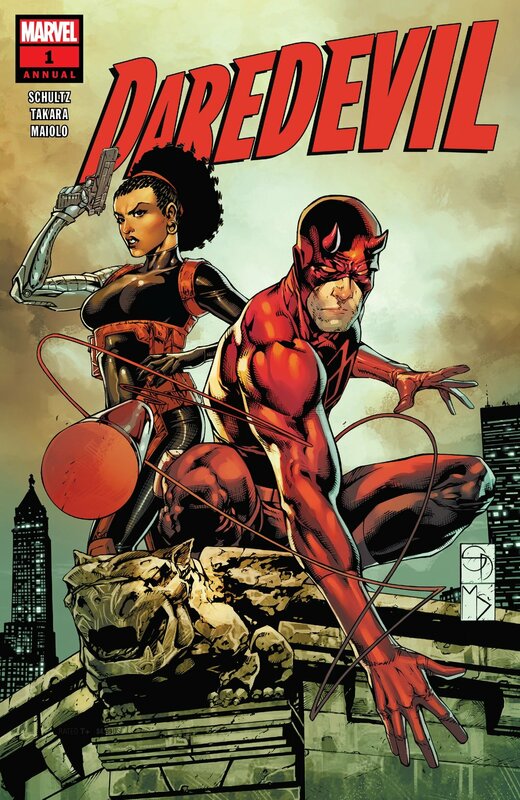 It creates a timeless “sometime back then” for the characters to exist in, and works as a fantastic introduction to both Misty Knight and Daredevil. The art for this book is a drastic change from the currently running story, but Takara and Maiolo have a style that really works for this standalone tale. A few pages feature stylized heroes in a child’s imagination, and the style used by Takara is wonderfully childlike without being kiddy. Marvel should make note and keep Takara on for some books intended for a family-friendly release, because it looks awesome. Outside those pages, though, Takara’s pencils and pens work incredibly well for Daredevil’s noir-esque style. Shadows are everywhere in the inks, and the design and execution of the “monster” at the end of the story is a neat addition to the street crime section of Marvel. While the book would still be enjoyable in black and white, Maiolo’s colors add a delightful extra dimension to the work. The aforementioned imagination pages are great, with bright and friendly colors to highlight Takara’s wonderful art. The tonal shift going from that to the regular pages is a rough one, but it’s also a perfect switch from the innocence of a child to the reality of an adult. The final battle of the book also takes place at twilight, with the city lights providing a lovely glow to the backgrounds. Maiolo is a wonderful match for Takara in this book, and it lifts the book up to a must-read tier. A solidly fun story, great art, and a rare perfect execution to both make this a great one-shot annual that everyone should check out at some point. If you like Daredevil’s runs on Netflix, this is a great book to start on Hornhead’s comic adventures, but it’s also a fantastic introduction to Misty Knight as well. Fans of both characters have something to enjoy here.